Inspired by his visit to Camp Pendleton and “The Noose”, Tech N9ne made history this past December when he visited US troops in the Middle East as part of his first ever USO Tour. Following his return from the trip, Tech N9ne sat down wit USO.org for an insightful interview on his emotional and significant journey to perform for the brave men and women in the US military. “I knew that these kids were from everywhere and me being who I am, I go everywhere. These people knew who I was and it made me feel good. I’d be back stage and test them. We gave them a great show. I went in the crowd with them. It was a wonderful feeling that they may not know about Tech N9ne and maybe some listened to country (music) and yet still loved the show and got me. 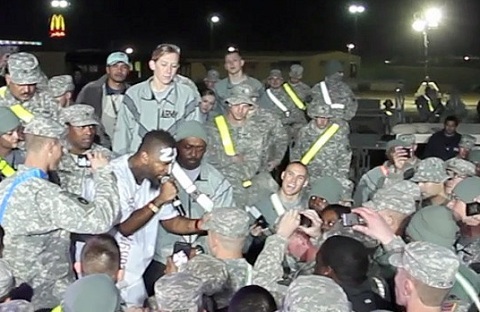 Watch highlights of Tech N9ne’s USO Tour below. What did you think of Tech N9ne’s comments? Have you watched his performances from the USO tour?